Many years ago, I bought a pattern for a swing coat and enough Jamieson’s Chunky Shetland to knit it. I wore it a bit but ultimately didn’t like the cut. It was too boxy and the collar wouldn’t stay put. I frogged the coat and knit the yarn into a boat neck pullover. I was relatively new to garment knitting at that time; I could adjust the sizing for the body of the sweater but didn’t know how to rework the armholes and sleeves. As a result, the body of the sweater fit as intended, but the armholes and sleeves were disproportionately large. I frogged the pullover and tried a turtleneck sweater. This pattern was worked seamlessly from the top down and the proportions didn’t appear to need any adjustments. Despite the fact that I was pregnant at the time and couldn’t try on the sweater or predict what my post-pregnancy size would be, the fit of the sweater was perfect. I still wear it. The original swing coat required a lot more yarn than the final sweater, so I had quite a bit of leftover yarn. Most of that yarn had been knit, soaked, frogged, and reknit more than once; I thought that I had a good handle on how it reacted to a soak. 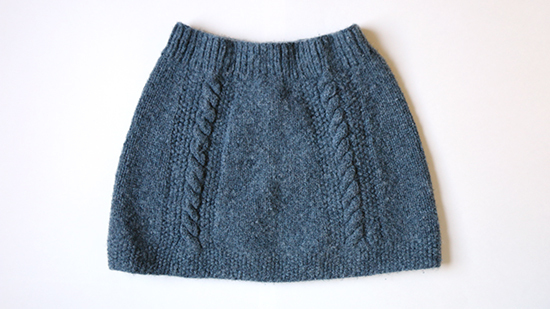 In 2012, I used most of the leftovers to knit the Bryn Mawr Skirt pattern by Nancy Eiseman. It fit wonderfully — until I soaked it. Then it grew. And grew. Thankfully, this yarn felts readily. I felted the skirt until I wouldn’t feel comfortable wearing it if it were any shorter. I hand-sewed some elastic into the still-oversized waistband and had something wearable. I think I may have worn the skirt twice in the five years since then. I was looking at the skirt the other day, and thought it was about the right shape and size for a tote bag. With some of the excess yarn from my stash, I knit a set of straps two at a time on the same set of needles in a simple K1 P1 ribbing that matches the waistband on the skirt. I soaked the straps and felted them in the dryer with a load of jeans. When the felted straps looked similar to the skirt, I used the cable details as markers for where to attach the straps. I closed the bottom edges of the skirt and used the moss stitch band at the base of the skirt as a guide for folding the corners up into gussets. The tote bag was soaked one more time and returned to the dryer for another round of felting. I’m happy with the result. The bag is roomy, durable, and a step up from casual. After we finish our move and I have access to my sewing machine again, I’ll add a lining with a few pockets. Oh, and in case you’re wondering: I still have enough Jamieson’s Chunky Shetland in my stash for another small project. Since I don't knit, can I assume that frogging here means pulling the yarn out of the project to reuse for another project? 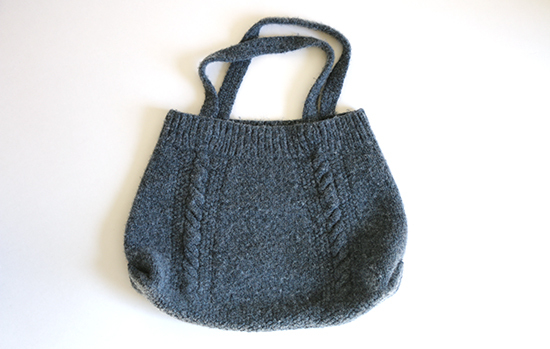 Regardless of my ignorance in knitting, I can give an opinion of the asthetics concerning the skirt-turned-bag...love it! Of course, it must have been a great skirt but how you managed the handles for the bag is pretty genius. They match beautifully and the end result is absolutely lovely. Yes, frogging is ripping back a lot or all of the knitting (rip-it, rip-it) whereas tinking is carefully un-knitting one stitch at a time ('tink' is 'knit' backwards). Thank you about the bag! It´s good you finally found something that you like out of that beautiful yarn! The idea of making a purse from the skirt was a stroke of genius and inspiration. I like the outcome. Thank you! It's a nice roomy bag.